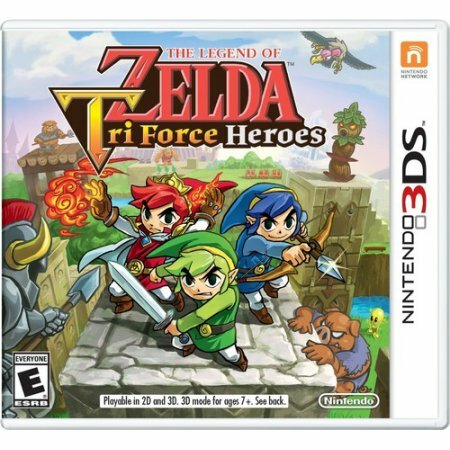 Right now score The Legend of Zelda: Tri-Force Heroes, Nintendo 3DS for only $12.99 (regularly $26.14) at Walmart. Select in store pick up to save on shipping! The same game is on Amazon for $24! Grab two friends1 and prepare for a bold, new Legend of Zelda™ adventure! Each of you will play as Link™, working together to conquer inventive dungeons and bosses. For the first time, stack three Links into a totem to solve puzzles and defeat enemies. Don’t forget to pick an outfit to wear— each one offers a different boost or ability! All three players share a life gauge! So you’ll have to work with your fellow Links to defeat enemies and solve puzzles. Or go it alone! In single-player, control Link and two paper dolls in the same dungeons from multiplayer mode. Each one contains four separate areas, not to mention epic boss battles with layered strategies. Counter with your own layered strategy: stack three Links with the totem mechanic to reach new heights. But remember to dress for success! Unique outfits include the Legendary Dress, which increases your chance of finding hearts, while the Kokiri Clothes, lets you shoot three arrows at once. Good things come in threes!